Pollution can pose a serious threat to aquatic ecosystems, our enjoyment of the waterways, and the health of humans, pets, and wildlife. We need you to help us keep our waters clean. Don't let pollution go on unnoticed! Please use this form to report pollution, illegal dumping, suspected clean water violations, or for other pollution you witness while out on the water. All reports remain confidential. While we do accept anonymous reports, not providing contact information will make it more difficult for us to act on any tips. Most of the fields on this form are optional. But remember, the more details and information you can provide will enable us to more swiftly and appropriately respond to your report. Please list the river or water body where you witnessed the pollution. Please list the GPS coordinates or other identifying information such as nearby landmarks, river mile, nearest boat ramp, address, etc. Please be as specific as possible. Include observations such as odors, colors, debris, dead fish, other boats or people nearby, etc. Please describe the weather observed at the time of the incident, including water conditions and air temperature. Do you have photos, videos, or other evidence showing the pollution? *If you have photos or videos, click here to upload. Please be sure to name all uploaded files so that they can be easily identified (e.g. Meramec River 10/13/18 LastName). Did you take any samples? Which agencies, if any, have you already contacted to report this pollution? Is there anything else we should know that might help us respond to this report? Thank you for being a clean water advocate and reporting pollution. Please check out our page on the Water Reporter website and download the app on your iPhone or Android device to make it easier to report clean water violations and engage with others in your watershed. 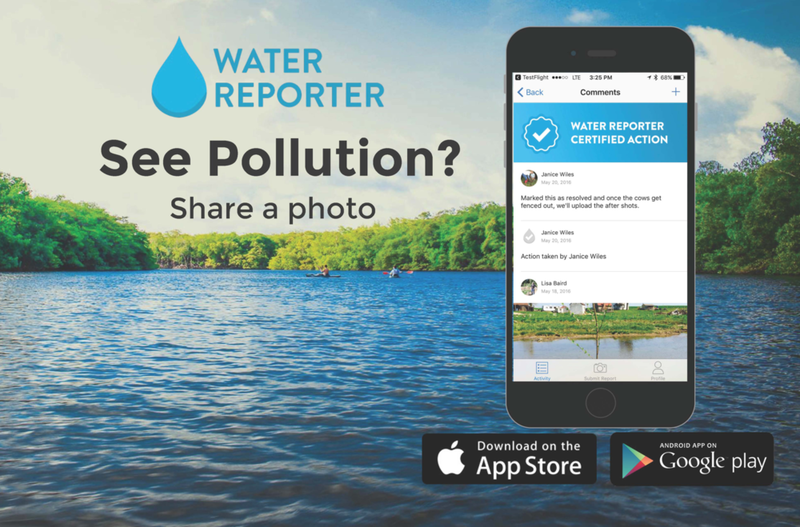 After clicking on the link above to report pollution, check out our page on the Water Reporter website by clicking here, and download the app on your iPhone or Android device to make it easier to report clean water violations and engage with others in your watershed. Water Reporter is a social network optimized to support watershed initiatives. Water Reporter members help to build a living record of experiences and conditions on the world's waterways. Their actions create connections among citizens and organizations working toward the common goal of improving water quality.